Tired of that old bathroom with its cramped space, moldy tub or shower, outdated fixtures, and lack of storage? TIMCO has the answer: a complete bathroom remodel or renovation. After all, our specialty is beautifying your home! What better way to accomplish that than by creating a bathroom that looks like it’s right off the page of a magazine. If you can dream it, we can do it! We offer full bathroom remodeling services all the way from the planning stages through to the completion of an entire upgraded bathroom project. Our specialists can design a brand new bathroom using your existing space or, in certain applications, expanding to add more space. Our professional and competent staff will guide you through each step of the bathroom remodeling and renovation process to make sure the final result is something you can enjoy and be proud of for years to come. As a full-service professional remodeling company, we have the experience and capabilities to handle a home or commercial remodel of virtually any size or scope. Whether it’s a single or multiple bathroom remodel, we are the Tulsa bathroom contractor you’ve been looking for and we are ready to get started on your next big project! As one of Tulsa’s leading remodel contractors, we also serve the surrounding areas, like Bixby, Broken Arrow, Sand Springs, Owasso, and Jenks. Are you putting off that much-needed bathroom renovation because you live in a single bathroom home and can’t possibly imagine the nightmare of having to go too long without? Well, put it off no more because TIMCO is up to the challenge! We will work with you to plan a bathroom overhaul that is completed as quickly as possible and we will figure out ways to ensure you have access to some sort of facilities for the duration of the project. Most people spend quite a bit of time in the bathroom, so having that room look fantastic and provide outstanding functionality is worth every penny you spend. As a bonus, a bathroom remodel or renovation in Tulsa will provide an excellent return on your investment should you ever need to sell. When it comes to projects that will raise your home’s value, a bathroom upgrade is definitely on that list. Just keep in mind that bathroom remodeling should always be done by a professional to make sure that the work is up to standard and that the efforts will definitely increase the resale value of the home. Before you even start calculating your return, though, you must take a realistic look at your budget. TIMCO professionally manages budgets of all sizes. Discuss what you’re willing to spend before you move ahead with planning the project to ensure that all parties are on the same page financially. It absolutely cannot be stressed enough: You need a plan. If you don’t have a plan, you will spend more money than you want to or need to. Generally, the complete rebuild of a master bath takes about four months to plan and two months to execute. Expect the planning phase of any bathroom project to take about twice as long as the work itself whether you’re remodeling a large bathroom or a small half bath. Then the ‘fun’ part begins. From cabinets to bathtubs to the finishing fixtures and everything in between, all the pieces must be chosen and all the parts must fit together cohesively before the project can begin. Our role in this phase is to translate your needs and desires into creative, functional, and aesthetically pleasing design possibilities. It is extremely important to select ALL of the materials during the planning stage. We carry a full line of standard cabinets in a variety of woods and finishes for you to choose from, as well as offer custom cabinets where needed. Real beauty in cabinetry is not only about the way it looks, but also about the way it lasts. Which is why we recommend Waypoint® cabinetry built with American pride and craftsmanship using the finest materials available. To complement your cabinets, you may choose countertops made from laminate, solid surface countertops (such as corian countertops or acrylic countertops), tile, or granite in an array of beautiful colors and textures. Consider inviting Wilsonart® laminates into your home with the very best in looks and enduring wear. They offer a wide range of exquisite laminates that are exceptional not only for their tasteful good looks and warm, lifelike appearance, but also for their reasonable prices. We offer all types of tub surrounds and showers made from fiberglass, tile, marble, granite or solid surface. You may also choose from standard or whirlpool tubs, walk in showers or both. We can use all types of flooring from ceramic tile to natural stone and everything in between. We also offer such luxury items as heated tile floors, heated towel bars, and even heated toilet seats. Everything can be customized to meet your needs and wishes. After you have the cabinets, countertops, and flooring picked out, it’s time to decide on paint colors or wallpapers along with lighting, bathroom fixtures, and faucets to brighten up the space and balance the overall look of your bathroom. If it’s available, we can do it! Once the budget, goals, and design of the project are firmly etched in the minds of everyone a construction schedule can be laid out. A good construction schedule is well-defined but flexible and ensures that all materials are safely delivered and stored at the job site prior to demolition. Our experienced staff will establish a means of communication for all parties involved during the course of the project to make sure everyone stays on schedule. Finally, a project-completion schedule is developed. This outlines the sequencing of each step of the project, including who will perform it and what materials are needed to complete it. To prepare your bathroom workspace for deconstruction first, remove all of your personal belongings, including everything inside the cabinets or in linen closets. It’s also a good idea to remove any pictures that might be hanging from adjacent walls to the bathroom and to cover any furniture or items that are in adjacent rooms with drop clothes before the demolition begins. Demolition and removal of old wallboard and fixtures brings you face-to-face with the reality of what is going on behind your walls. With luck, everything will be dry and tight. However, if any evidence of water damage, dry rot, or mold damage becomes apparent then TIMCO will help you take care of it before beginning the rest of the project. Just keep in mind that any discovered issues may blow your initial time frame and budget depending on the extent of work required. Sometimes remodels, especially major ones that reconfigure a room, require that existing electrical wiring or plumbing be moved so that new fixtures can be installed in the correct place and to code. Remodeling a bathroom can be a relatively complex venture because it usually involves a lot of plumbing. Select plumbing fixtures, like bathtubs and showers, carefully for their quality and their cohesiveness fitting together with all of the other features in the bathroom. A bathtub or shower must be installed before the drywall process. It can take several hours to set into place, and attach the drain and overflow connections. Custom-built showers can take several days because they require installing the cement floor and liner, drain, and cement board walls. TIMCO is one of Tulsa’s leading drywall contractors! We work hard to get the job done correctly, neatly, and in a timely manner. The drywall phase of bathroom construction shows progress rather quickly. Once the plumbing lines and tub or shower have been installed, electrical updated, and insulation added, then the drywall is installed, taped, plastered, and sanded. After the drywall is hung and the studs are covered back up, the room again takes on its shape. In a bathroom, water-resistant green board may be used on most walls, and cement backer board should be used in showers and behind tub surrounds. 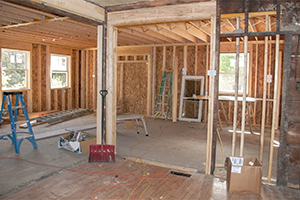 Expect the drywall process to take several days, especially when it’s humid outside, as many layers must be done and higher humidity makes the plaster take longer to dry. After the drywall is in place the tub surround is installed next. Solid surface surrounds are easier to maintain than tile and, with no grout lines, there is less opportunity for leaks. Finally, the walls and ceiling are painted before the next phase begins. 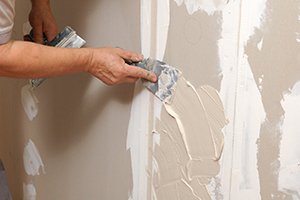 The key in a bathroom is priming all paintable surfaces to seal the drywall and plaster. By choosing a high-quality sealer and having it tinted a lighter shade of your wall paint, you can prime twice and paint once for an impenetrable surface that repels moisture. The painting process goes fairly quickly when dealing with an empty room. Linen cabinets and vanities need to be installed before the flooring is put in. This is also a good time to install lighting fixtures. Bathroom cabinets are essential to maintaining an organized and clean bathroom. Waypoint® cabinetry is built to last and steps are taken throughout the installation process to ensure that it does. Sometimes the cabinet installation is also done in phases around the fitting of the countertops; generally with the lower cabinets completed first and any upper cabinets completed later on. Custom built cabinets are usually stained or painted and finished out on site. When the cabinet installation is complete, the crew may need to touch up some of the paint on the walls that occasionally gets scraped off during the installation process. Once the lower cabinets are in place, they will be measured and templates are created so that the countertop can be precut at an offsite facility. This part of the process typically takes a week or two, but while waiting for the countertops, the rest of the upper cabinets can be installed along with lighting fixtures and few other small things. 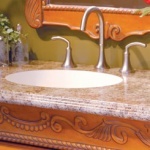 With all the many choices available for bathroom countertops (Formica laminate, solid surface, corian, acrylic, etc.) there might be some slight variances in the process depending on which material you’ve chosen to use. Finally, the flooring is installed to complete the last major phase of the bathroom remodeling process. Bathroom floors benefit from being waterproof. A solid linoleum or tile floor will make it easy to mop up after bathing and even the most rambunctious kids can’t damage it. Depending on the type of flooring that was chosen, the length of time for this phase to end can vary as something like solid linoleum is a lot quicker to install than individual tiles. TIMCO installs all types of flooring from natural stone to ceramic tile and everything in between. Like a jack-of-all-trades, we consider ourselves Tulsa’s best tile installer, Formica laminate installer, natural stone installer, and more. We do it all! Ah the finishing touches, those last few details that really bring character to your bathroom and wrap up your remodel or renovation project with a nice little bow. During this process the crown molding and trim are installed, the bathroom sink is put into place with all of its fixtures plumbed, the toilet is reseated, and any other custom features are mounted. Lastly, there are still a few small details such as installing towel bars, shower curtain rods and curtains, and other accessories. Try to have these items ready to go before the end of the remodeling process, that way as soon as the crew is done you can add these simple, but essential bathroom elements right away. After all that, dust is everywhere! But no worries, TIMCO also has a great clean up crew! We are experts at efficiently and thoroughly cleaning up after major remodeling projects. By the end of this phase “The bathroom of your dreams” will be clean and ready for you to use.